Summary: Kitchen Remodels Part 2 covers Contractors, Permits, Codes and Inspections with Fully Explained Photos and Helpful Ideas. Most remodel projects are difficult to bid accurately, and most contractors will want to come out to the home to have a first hand look at what they will be working with. There will be many factors that will need to be identified and considered to prepare the bid price for the project. Once the walls are opened; the condition of the inside of the walls may reveal items that need attention, such as water leaks, mold or mildew, wood rot, termite damage, the infestation of insects or even rodents. If these items are discovered they should be pointed out and decisions will be required about how to correct any problem during the kitchen remodel project and restore the integrity of the structure. 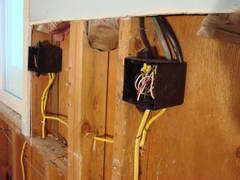 Even though you had a set of plans to bid from, it is typical that the homeowner has not finalized a few details that will have a direct affect about where some of the electrical wiring will be installed and the size of some circuits. I have adopted a policy which always makes the homeowner or developer very happy, and that is that I wire the home as if I were going to live in it, so I really pay close attention to every detail. This holds true even if you are wiring a spec house which is sold during the building phase which will require special handling through the developer if additions or changes are made. Some developers do not want to have too may options given to the homeowner because it might upset the flow of work, however in most cases I have positive responses and appreciation for pointing out something that should be relocated or an option that should be considered. The point is this, once the walls are closed up any additions or changes will be much more expensive to add then if they were installed during the construction phase while the walls are open. Additionally, I never want to have a homeowner ask me why I never asked them about adding or changing something that may be mentioned to them after the project is all finished. Besides, you are adding value to the home and your reputation as you present the homeowner with options that you are up to date about. One of the best ways to avoid a bad kitchen remodel project is to make sure the project is done with a permit, and then receives all of the necessary inspections. What if You Decide Not to Get a Permit? As mentioned before, this is one of the biggest mistakes that will most likely lead to a remodel project that turns out very bad. Keep in mind that future inspections of the home will reveal any improvements which will be questioned, and may require inspection reports and permit documentation. If a building department is notified of a non-permitted project, they will want to inspect the project which may result in a request to gain access to areas that are covered up, which could result in removing sheet rock or other components. A permit will need to be issued and fees paid, including possible penalties. Some code requirements are straight forward and require a something specific, such as a dedicated circuit; however there are some codes that may be fulfilled by choosing from a variety of compliant items such as lighting fixtures and controls. Although some areas may not have adopted certain energy codes this is a great time to consider these options that may help reduce your electric utility bills. As mentioned, kitchen remodel projects can be identified with several categories and may mean something altogether different depending on a person's individual focus or goals, so let's look at a few categories that may full under the heading of home improvements with the focus being on how these home improvements will affect electrical wiring. The nationwide quest to become more energy efficient has encouraged the production of new products at an increasing rate featuring new technologies that are being adopted by the NEC and many are required to be installed into homes when upgrade projects are performed. Kitchens in some areas may require high efficacy and low-efficacy lighting to be controlled separately by their own switches, and at least 50% of all installed wattage must be high efficacy lighting providing a uniform pattern of illumination and shall be switch controlled separately from any other decorative low efficacy kitchen lighting. The set of plans must be at the job site along with the permit card in a safe place such as a tube or a large plastic zip lock bag. The inspector will always check for the Notice of Commencement to make sure the project has been approved to begin. At the first inspection notes will be recorded on the permit card which will be referred to during future inspections. Right before the insulation process and sheet rock or wall coverings are installed the rough inspection will take place. This inspection will focus on the work that has been done by the electrician, plumber, heating and ventilation contractors. The majority of the roughed-in materials for these trades will be covered up and not accessible once the sheet rock or wall coverings have been installed. The trim out phase is when the devices are installed, such as electrical switches and receptacle outlets.